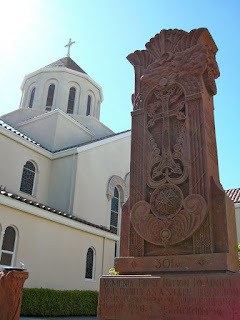 Here's a surprising thing to find in the Inner Richmond district: an Armenian Apostolic church. As the stone proclaims, Armenia was it the first nation to embrace Christianity on an official basis (in 301AD). Following a theological dispute in 554, the Armenian church has been separate from both Eastern Orthodoxy and Roman Catholicism.